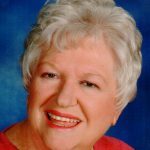 Beckey Lou Mullis Blair passed away Tuesday, September 11, 2018 at her home in Lakeside at the age 80 after a long battle with cancer. Visitation is from 2 p.m.- 4 p.m. on Sunday, September 16 at Biggers Funeral Home. Funeral service is at 10:30 a.m., Monday, September 17 at Northwest Church of Christ. Burial is at 4 p.m. Monday at Aspermont Cemetery, Aspermont, Texas. Memorials can be made to Northwest Church of Christ or the ASPCA. Becky Mullis was born November 6, 1937 in Swenson, Texas to Clarence Wilson and Thelma Mullis. She graduated from Lake Worth High School and married Vernon Ray Blair on April 23, 1954. They raised three daughters and a son. Beckey became a florist and cake decorator for employment. She enjoyed planting flowers, fostering dogs, and helping with teaching the two and three year olds in Bible Class and Vacation Bible School. She was a faithful member of Northwestern Church of Christ. Beckey is survived by her four children, Elaine, Chris, Kenda, Blenda; grandchildren, Jay, Jocelyn, and Wyatt; great-grandchild, Love Rozelyn; aunt, Estelle “Tootsie” McDonald; cousins, Loise and Jimmy Russell McDonald, extended family and many friends. Be the first to share a memory of Beckey.